Virginia's View Challenge is coming to an end at the end of Dec. 2015. Yup, it's true. (see announcement here). So this month's challenge will be the last one! You can read all about the details of this challenge over here. For this month, we are all about using glitter! I took a full on approach and made a glittery snowflake. ~good-old fashioned Stickles: I applied clear stickles and let them dry. ~glitter embossing powder: I did the embossing 2-3 times. The glitter embossing powder has a lot of Rainbow Sparkle bits in it. I think if you have not tried any glitter embossing powder, it's time to make that "investment"! And don't forget the power of silver/gold embossing either! ~silver shiny pattern paper: this is the most convenient way to add shine to your project. AND there is no mess! This DCWV Glintzy Glitter Paper is one of my go-to papers for adding glitter. ~sequins (gemstones, pearls....etc): need I say more!? I have a few amazing guest designers lined up to inspire! 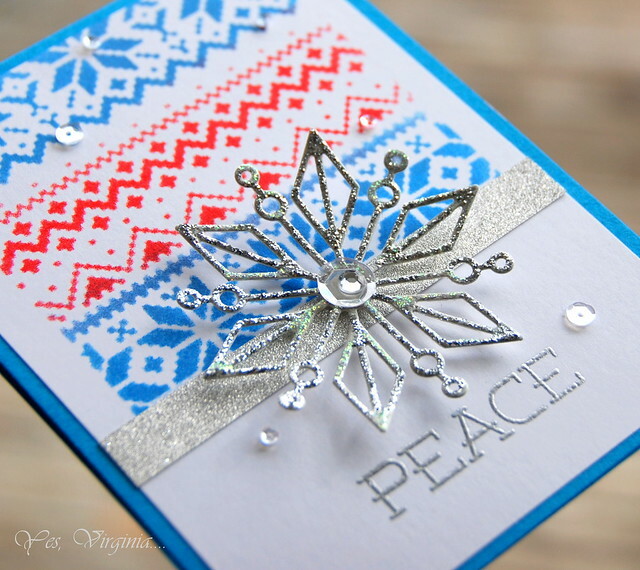 The best part of running this challenge is to share the love and joy of stamping/card-making. I also got to know quite a few card makers along this journey. I must say, despite all the hard work and time (along with Dr. John's and Stephanie's) it has been a win win situation for me. There will be TWO $25 Simon Says Stamp Gift Vouchers awarded to two winners. I hope that you will play this challenge to celebrate and end it with a bang! All great things . . .
One of my favorite cards! Thanks. Love this card, Virginia. I rarely use glitter, really never, but do use glitter paper. You did a nice thing with your challenge. I realize it entailed a lot of work for you, I sure enjoyed the projects. Love this so much, Virginia!!! Just love! Beautious twinkling...love you card and especially the nordic background. That and the snowflake were made for eachother. The colors on this are STUNNING!!! I LOVE how you glittered up that snowflake!! Stunning card, Virginia! Just love the snowflake and nordic pattern. I can't believe VVC is coming to an end... for the time being, I hope. Your sparkly snowflake just takes my breath away, Virginia! 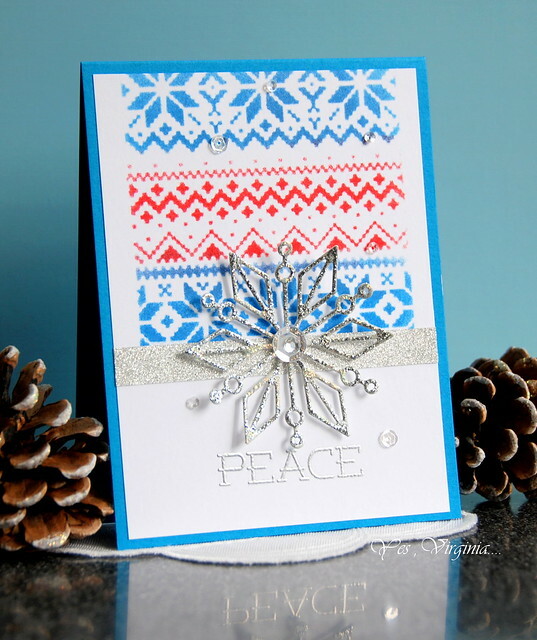 I love how you stenciled the winter knit pattern on the background, too...Such a gorgeous card! GORGEOUS card Virginia!! Love the delicate snowflake!! Love this design! Great use of the stencil and love the sparkle! So festive & beautiful, Virginia!